By now, it is widely known that Gopala Gopala is a remake of Akshay Kumar, Paresh Rawal starrer Oh My God. Since the Telugu version stars Pawan Kalyan and Venkatesh, the film has been hyped a lot and everyone is eagerly waiting to see how a film that has two big stars will fare at the box office. Though it was initially said that the film will be tweaked to suit the range of the lead actors and the tastes of Telugu audiences, the makers seem to have decided to stick to the original script eventually. 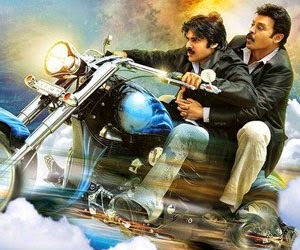 It was said that Pawan would have a solo song and that Venkatesh would have a duet. But since the audio has been released, one can see that the unit has refrained from playing with the original version. Music has been composed by the new boy in T Town, Anup Reubens. While Bhaje Bhaje has a commercial feel to it, the remaining two songs are completely situational. Unfortunately, none of the songs help in increasing the expectations from the film. In the Hindi film, the item song Go go Govinda song with Prabhu Deva and Sonakshi Sinha was a huge hit. Surprisingly, there is no such item number in the Telugu album. So, it can be safely said that the music is not going to be the highlight of the film. Yet, the songs help in setting the right expectations on the film. If you listen to them once, you will realize that the film is not your regular commercial entertainer. Now, it remains to be seen how far these expectations will work out at the box office.